Osiris is the God of mortality and of the mortal being as mortal, hence in the ultimate stages of the development of Egyptian theology, any deceased individual is identified with Osiris, as is reflected by the use of ‘Osiris N.’ to refer to the deceased in the collections of afterlife literature known as the Coffin Texts and the Book of the Dead, where the conventional ‘N.’ of the translators represents the insertion of the name of the person on whose behalf the copy of the text was produced. This identification bridges gender, males and females alike being referred to as ‘Osiris’ in this context, albeit occasionally Hathor replaced Osiris as the vehicle of divine identification for the female deceased; and the Osirian identification apparently bridged species as well, since as animals who received funerary rites, such as the Apis Bull, could be ‘Osirianized’ as well. Osiris is depicted anthropomorphically, virtually always mummiform, holding the crook and flail, symbols of royalty, and the atef crown, which resembles the ‘white crown’ of Upper Egypt but with two plumes on either side. 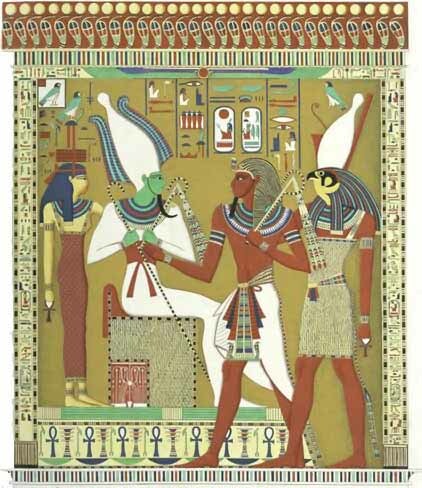 The skin color of Osiris is generally green, symbolizing vegetative life and renewal. No single convincing interpretation of the name ‘Osiris’ has come forward (for the various hypotheses, see J. G. Griffiths, “Osiris,” in Helck and Otto), but the Os- component is written with the same sign – a throne, with the meaning ‘seat’ or ‘place’ – as the Is- component in the name ‘Isis‘, while the -ir component is written with an eye, as the verb ‘to make’, hence the wordplay of PT utterance 684: “the King will take his place as Osiris,” or “make his seat like Osiris.” A connection to the word wsr, ‘mighty’, has also been suggested. The most characteristic epithet of Osiris is wn-nfr, or ‘Onnophris’, meaning ‘Enduring in well-being/the good’. Osiris is the passive object of the opus of resurrection, to which virtually all of the Gods of the Egyptian pantheon make a contribution large or small, just as they make their contributions to the defense of Re, the one pertaining to the cosmos as a whole, the other to the life cycle of the individual mortal being. Like many Egyptian myths, that of Osiris is not known to us through a narrative account, but rather through countless allusions to it in hymns, rituals and spells. The Greek philosopher Plutarch offers a famous narrative in his On Isis and Osiris, but this text can only be trusted to accurately transmit Egyptian ideas intermittently. Perhaps the longest single Egyptian account of the myth is the ‘Great Hymn to Osiris’ on the stela of Amenmose (18th dynasty) (trans. in Lichtheim, vol. 2, 81-86). What is clear is that Osiris, son of Geb and Nut, brother and husband of Isis, and king of an ideal Egypt, is murdered by his brother Seth, although the method is not clear. Vagueness on this subject comes about not only through a reticence in Egyptian sources to dwell at length on an inauspicious topic, but also probably because the death of Osiris at the hands of Seth is meant to symbolize all the diverse causes of mortality. Some part of Osiris’ fate involved being cast into the Nile and recovered (brought ashore, according to an important tradition, at Memphis) and some part involved dismemberment, although the ‘drowning’ and the ‘dismemberment’ are probably substitutable alternatives rather than discrete elements in a single account. The immersion of Osiris in the Nile, while it is on the one hand a symbol for disintegration, also establishes the immanence of Osiris in the Nile’s life-giving annual inundation; a related tradition is that the phallus of Osiris was never recovered from the Nile, but rather was consumed by a carp. This connection of Osiris to agriculture via the inundation is stronger than the identification claimed by older scholarship between Osiris and the crops themselves, the primary evidence for which is the beds for barley sprouts in the shape of Osiris which were a feature of the Osirian rites. The ‘Great Hymn’ is, at any rate, paradigmatic in its account that Isis “sought him without wearying … roamed the land lamenting, not resting till she found him,” (83) and that Isis protects the prone Osiris from further attacks, being “his guard … who drives off the foes, who stops the deeds of the disturber by the power of her utterance,” that is, her magic primarily, but also possibly as ruler in his stead, for she is characterized here as “the clever-tongued whose speech fails not, effective in the word of command,” (ibid.). Osiris is somehow reconstituted and resurrected, an event typically depicted by Osiris laying upon a bier while Isis hovers over his erect phallus in the form of a small bird of prey, either a kestrel or kite; the ‘Great Hymn’ describes Isis having thus “created breath with her wings,” (ibid.). Isis creates the missing phallus of Osiris for herself by means of her magic, a symbol for the magical reconstitution or resurrection of Osiris in general. Isis copulates with the risen Osiris, conceiving Horus, whom she raises in secret to vindicate Osiris and claim the sovereignty. The resurrection of Osiris, being ‘metaphysical’, so to speak, does not result in his return to his prior life, but his assumption of his new role as lord of the dead, Khenty-Amentiu, ‘Foremost of the Westerners’, an epithet which refers to the West (Amenti) as the land of the setting sun and hence of the dead. In this sense, the Egyptians resurrection is not a negation of mortality, but is instead predicated upon it. The futurity of Osiris is represented instead by Horus, who is conceived, in effect, posthumously; or, better, the reconstitution of Osiris is one and the same magical act as the conception of Horus, which is its proof, so to speak. The myth of Osiris and Horus is a myth of royal succession, in which the living king is Horus in relation to his deceased predecessor Osiris, whether or not there is a blood relation between them; but the myth becomes the basis for a doctrine of salvation. Horus vindicates his right to succeed to the sovereignty of the ideal Egypt before a tribunal of the Gods, to whom he must prove his claim against Seth, and when he is found ‘justified’ (lit. ‘true-of-voice’, ma’e-hru) and given sovereignty over the cosmos, there results universal jubilation inasmuch as the succession of Horus represents the victory over death itself as well as the triumph of legitimacy and civilization over the rule of force. 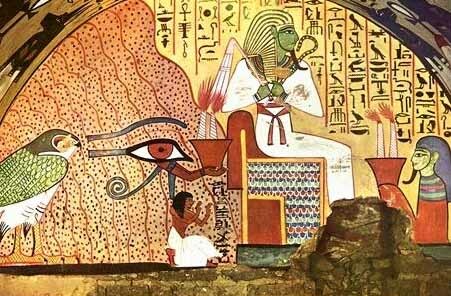 Osiris himself presides over the tribunal which judges the dead, an event which assumes its most characteristic form in BD spell 125 with the ‘weighing of the heart’ (the conscience, as it were) – against Ma’et (truth, justice, the cosmic order). The territory in dispute between Horus and Seth is, in a sense, Osiris himself, insofar as the parts of Osiris’ body are associated (albeit with some inconsistency and redundancy) with the nomes, or districts, of Egypt as well as the limbs of an ideal living being who is, in effect, every mortal being. Moreover, as can be seen from spells in the afterlife literature having as their goal the divinization of the parts of the deceased’s body by identifying them with various Gods, the entire pantheon of Egypt has a stake in the resurrection of Osiris and are, in some sense, manifest in his resurrected body. The body parts of Osiris were not understood to be interred at different places around the country; tombs of Osiris at several places around Egypt – the Abaton near Philae, Abydos, Busiris, Herakleopolis Magna – were rather resting places of his whole person, however this was conceived. The identification of the districts with the limbs of Osiris affirms the nation’s indivisibility, not its fragmentation, by literally taking up or ‘incorporating’ the local cults into the God’s body (Hans Betz, “Reliquie,” in Helck and Otto). Furthermore, the ‘dismemberment’ of Osiris is simply decomposition into formlessness, as contrasted with the integrity that is synonymous with life and hence with resurrection, and it is the integrity and totality of Osiris which theology consistently seeks to emphasize. Thus, for instance, PT utterance 247, possibly the earliest extant hymn to Osiris, calls Osiris ‘the Complete’, tem, associating him thereby with Atum, his great-grandfather. This point about integrity and resurrection helps to clarify the Egyptians understanding with respect to mummification. Inasmuch as the only genuine guarantee of the integrity of the body is not its embalming, but its resurrection, since only a living body is unified and integral, the mummy is properly regarded as a locus for the work of resurrection, and a shelter for the individual in that process, rather than as the goal of that process as such. Patron of: the Underworld, the dead, past Pharaohs, agriculture (old form), fertility (old form). Appearance: In his original form, a green-skinned man dressed in the raiment of a pharaoh. Following the Legend of Osiris, he appears as a green-skinned man in the form of a mummified pharaoh. 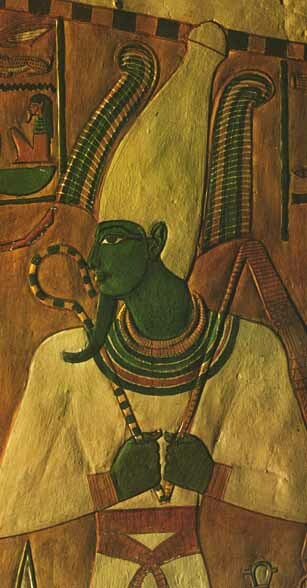 He is often depicted wearing the atef crown with a pair of ram horns at its base. Description: Throughout the height of Egyptian civilization, Osiris was the primary deity. In power, he was second only his father, Ra, and was the leader of the gods on earth. He was the husband of Isis and the father of Horus (and a number of other gods in some stories). Osiris resided in the underworld as the lord of the dead, as after being killed by Set, even though he was a god, he could no longer dwell in the land of the living. After Osiris was killed, Isis resurrected him with the Ritual of Life, which was later given to the Egyptians so that they could give eternal life to all their dead. The spells and rituals cast by Isis, plus many others given to the people by the gods over the centuries, were collected into The Book of Going Forth by Day, colloquially known as The Book of the Dead. In the underworld, Osiris sits on a great throne, where he is praised by the souls of the just. All those who pass the tests of the underworld become worthy to enter The Blessed Land, that part of the underworld that is like the land of the living, but without sorrow or pain. In some texts, in addition to the Judging of the Heart, Osiris passes final judgment over the dead, acting in this capacity as an Egyptian version of Radamanthus. There is an interesting parallel between Osiris, a fertility/agriculture god, and the Greek Persephone, an agriculture goddess. Both end up in the underworld through treachery and both are kept there by “legal loopholes” in the laws of the gods. Persephone remains in the underworld for half a year because she tasted the food of the dead. Osiris remains in the underworld because Ma’at dictates that the dead, even dead gods, may not return to the land of the living. Worship: Worshipped widely throughout all of Egypt, and his cult center was Abydos. A composite funerary god worshipped during the Middle Kingdom period. In this form he represents the three aspects of the universe: creation, stability, and death. Osiris was an Egyptian god, usually identified as the god of the Afterlife, the underworld and the dead. Osiris was at times considered the oldest son of the Earth god Geb, and the sky goddess Nut, as well as being brother and husband of Isis, with Horus being considered his posthumously begotten son. He was also associated with the epithet Khenti-Amentiu, which means “Foremost of the Westerners” — a reference to his kingship in the land of the dead. As ruler of the dead, Osiris was also sometimes called “king of the living”, since the Ancient Egyptians considered the blessed dead “the living ones”. Osiris is first attested in the middle of the Fifth dynasty of Egypt, although it is likely that he was worshipped much earlier; the term Khenti-Amentiu dates to at least the first dynasty, also as a pharaonic title. Most information we have on the myths of Osiris is derived from allusions contained in the Pyramid Texts at the end of the Fifth Dynasty, later New Kingdom source documents such as the Shabaka Stone and the Contending of Horus and Seth, and, much later, in narrative style from the writings of Greek authors including Plutarch and Diodorus Siculus. Osiris was not only a merciful judge of the dead in the afterlife, but also the underworld agency that granted all life, including sprouting vegetation and the fertile flooding of the Nile River. He is described as the “Lord of love”, “He Who is Permanently Benign and Youthful” and the “Lord of Silence”. The Kings of Egypt were associated with Osiris in death — as Osiris rose from the dead they would, in union with him, inherit eternal life through a process of imitative magic. By the New Kingdom all people, not just pharaohs, were believed to be associated with Osiris at death if they incurred the costs of the assimilation rituals. Through the hope of new life after death Osiris began to be associated with the cycles observed in nature, in particular vegetation and the annual flooding of the Nile, through his links with Orion and Sirius at the start of the new year. Osiris was widely worshiped as Lord of the Dead until the suppression of the Egyptian religion during the Christian era. Osiris is represented in his most developed form of iconography wearing the Atef crown, which is similar to the White crown of Upper Egypt (but with the addition of two feathers at each side—see Atef crown (hieroglyph)). He also carries the crook and flail. The crook is thought to represent Osiris as a shepherd god. The symbolism of the flail is more uncertain with shepherds whip, fly-whisk, or association with the god Andjety of the ninth nome of Lower Egypt proposed. He was commonly depicted as a green (the color of rebirth) or black (alluding to the fertility of the Nile floodplain) complexioned pharaoh, in mummiform (wearing the trappings of mummification from chest downward). He was also depicted although quite rarely as a lunar god with a crown encompassing the moon. The Pyramid Texts describe early conceptions of an afterlife in terms of eternal travelling with the sun god amongst the stars. Amongst these mortuary texts, at the beginning of the 4th dynasty, is found: “An offering the king gives and Anubis“. By the end of the 5th dynasty the formula in all tombs becomes “An offering the king gives and Osiris”. Osiris was the mythological father of the god Horus, whose conception is described in the Myth of Osiris and Isis, a central myth in ancient Egyptian belief. The myth described Osiris as having been killed by his brother Set who wanted Osiris’ throne. Isis briefly brought Osiris back to life by use of a spell that she learned from her father. This spell gave her time to become pregnant by Osiris before he again died. Isis later gave birth to Horus. As such, since Horus was born after Osiris’ resurrection, Horus became thought of as a representation of new beginnings and the vanquisher of the evil Set. Ptah-Seker (who resulted from the identification of Ptah as Seker), who was god of re-incarnation, thus gradually became identified with Osiris, the two becoming Ptah-Seker-Osiris. As the sun was thought to spend the night in the underworld, and subsequently be re-incarnated, as both king of the underworld, and god of reincarnation, Ptah-Seker-Osiris was identified. Osiris’ soul, or rather his Ba, was occasionally worshipped in its own right, almost as if it were a distinct god, especially so in the Delta city of Mendes. This aspect of Osiris was referred to as Banebdjedet, which is grammatically feminine (also spelt “Banebded” or “Banebdjed”) which literally means The ba of the lord of the djed, which roughly means The soul of the lord of the pillar of stability. The djed, a type of pillar, was usually understood as the backbone of Osiris, and, at the same time, as the Nile, the backbone of Egypt. 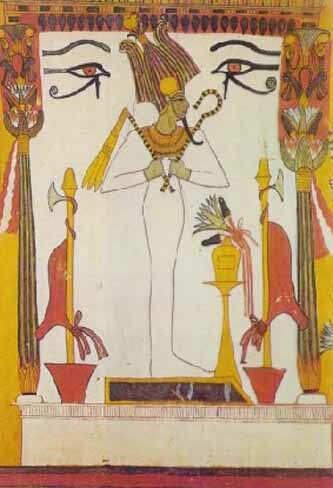 The Nile, supplying water, and Osiris (strongly connected to the vegetation) who died only to be resurrected represented continuity and therefore stability. As Banebdjed, Osiris was given epithets such as Lord of the Sky and Life of the (sun god) Ra, since Ra, when he had become identified with Atum, was considered Osiris’ ancestor, from whom his regal authority was inherited. Ba does not, however, quite mean soul in the western sense, and also has to do with power, reputation, force of character, especially in the case of a god. Since the ba was associated with power, and also happened to be a word for ram in Egyptian, Banebdjed was depicted as a ram, or as Ram-headed. A living, sacred ram, was even kept at Mendes and worshipped as the incarnation of the god, and upon death, the rams were mummified and buried in a ram-specific necropolis. Banebdjed was consequently said to be Horus’ father, as Banebdjed is an aspect of Osiris. As regards the association of Osiris with the ram, the god’s traditional crook and flail are of course the instruments of the shepherd, which has suggested to some scholars also an origin for Osiris in herding tribes of the upper Nile. The crook and flail were originally symbols of the minor agricultural deity Andjety, and passed to Osiris later. From Osiris, they eventually passed to Egyptian kings in general as symbols of divine authority. The cult of Osiris (who was a god chiefly of regeneration and re-birth) had a particularly strong interest toward the concept of immortality. Plutarch recounts one version of the myth surrounding the cult in which Set (Osiris’ brother) fooled Osiris into getting into a box, which he then shut, had sealed with lead, and threw into the Nile (sarcophagi were based on the box in this myth). Osiris’ wife, Isis, searched for his remains until she finally found him embedded in a tree trunk, which was holding up the roof of a palace in Byblos on the Phoenician coast. She managed to remove the coffin and open it, but Osiris was already dead. As per one version of the myth, she used a spell she had learned from her father and brought him back to life so he could impregnate her. Afterwards he died again and she hid his body in the desert. Months later, she gave birth to Horus. While she was raising him, Set was hunting one night and came across the body of Osiris. Enraged, he tore the body into fourteen pieces and scattered them throughout the land. Isis gathered up all the parts of the body, less the phallus (which was eaten by a fish) and bandaged them together for a proper burial. The gods were impressed by the devotion of Isis and resurrected Osiris as the god of the underworld. Because of his death and resurrection, Osiris is associated with the flooding and retreating of the Nile and thus with the crops along the Nile valley. Diodorus Siculus gives another version of the myth in which Osiris is described as an ancient king who taught the Egyptians the arts of civilization, including agriculture. Osiris is murdered by his evil brother Set, whom Diodorus associates with the evil Typhon (“Typhonian Beast”) of Greek mythology. Typhon divides the body into twenty six pieces which he distributes amongst his fellow conspirators in order to implicate them in the murder. Isis and Horus avenge the death of Osiris and slay Typhon. Isis recovers all the parts of Osiris body, less the phallus, and secretly buries them. She made replicas of them and distributed them to several locations which then became centres of Osiris worship. The tale of Osiris becoming fish-like is cognate with the story the Greek shepherd god Pan becoming fish like from the waist down in the same river Nile after being attacked by Typhon (see Capricornus). This attack was part of a generational feud in which both Zeus and Dionysus were dismembered by Typhon, in a similar manner as Osiris was by Set in Egypt. Plutarch and others have noted that the sacrifices to Osiris were “gloomy, solemn, and mournful…” (Isis and Osiris, 69) and that the great mystery festival, celebrated in two phases, began at Abydos on the 17th of Athyr (November 13) commemorating the death of the god, which is also the same day that grain was planted in the ground. “The death of the grain and the death of the god were one and the same: the cereal was identified with the god who came from heaven; he was the bread by which man lives. The resurrection of the god symbolized the rebirth of the grain.” (Larson 17) The annual festival involved the construction of “Osiris Beds” formed in shape of Osiris, filled with soil and sown with seed. The germinating seed symbolized Osiris rising from the dead. An almost pristine example was found in the tomb of Tutankhamun by Howard Carter. The first phase of the festival was a public drama depicting the murder and dismemberment of Osiris, the search of his body by Isis, his triumphal return as the resurrected god, and the battle in which Horus defeated Set. This was all presented by skilled actors as a literary history, and was the main method of recruiting cult membership. According to Julius Firmicus Maternus of the fourth century, this play was re-enacted each year by worshippers who “beat their breasts and gashed their shoulders…. When they pretend that the mutilated remains of the god have been found and rejoined…they turn from mourning to rejoicing.” (De Errore Profanorum). The passion of Osiris is reflected in his name ‘Wenennefer” (“the one who continues to be perfect”), which also alludes to his post mortem power. Parts of this Osirian mythology have prompted comparisons with later Christian beliefs and practices. The Egyptians of every period in which they are known to us believed that Osiris was of divine origin, that he suffered death and mutilation at the hands of the powers of evil, that after a great struggle with these powers he rose again, that he became henceforth the king of the underworld and judge of the dead, and that because he had conquered death the righteous also might conquer death…In Osiris the Christian Egyptians found the prototype of Christ, and in the pictures and statues of Isis suckling her son Horus, they perceived the prototypes of the Virgin Mary and her child. Biblical scholar Bruce M. Metzger notes that in one account of the Osirian cycle he dies on the 17th of the month of Athyr (approximating to a month between October 28 and November 26 in modern calendars), is revivified on the 19th and compares this to Christ rising on the “third day” but he thinks “resurrection” is a questionable description. A. J. M. Wedderburn further argues that resurrection in Ancient Egypt differs from the “very negative features” in Judaeo-Christian tradition, as the Ancient Egyptians conceived of the afterlife as entry into the glorious kingdom of Osiris. Marvin Mayer notes that some scholars regard the idea of dying and rising deities in the mystery religions as being fanciful but suggests this may be motivated by apologetic concerns, attempting to keep Christ’s resurrection as a unique event. In contrast he argues that the ancient story of dying and rising in the divine, human and crops, (with Osiris as an example), is vindicated and reaches a conclusion in Christianity. The First Day, The Procession of Wepwawet: A mock battle is enacted during which the enemies of Osiris are defeated. A procession is led by the god Wepwawet (“opener of the way”). The Second Day, The Great Procession of Osiris: The body of Osiris is taken from his temple to his tomb. The boat he is transported in, the “Neshmet” bark, has to be defended against his enemies. The Third Day, Osiris is Mourned and the Enemies of the Land are Destroyed. The Fourth Day, Night Vigil: Prayers and recitations are made and funeral rites performed. The Fifth Day, Osiris is Reborn: Osiris is reborn at dawn and crowned with the crown of Ma’at. A statue of Osiris is brought to the temple. Contrasting with the public “theatrical” ceremonies sourced from the I-Kher-Nefert stele, more esoteric ceremonies were performed inside the temples by priests witnessed only by chosen initiates. Plutarch mentions that two days after the beginning of the festival “the priests bring forth sacred chest containing a small golden coffer, into which they pour some potable water…and a great shout arises from the company for joy that Osiris is found (or resurrected). Then they knead some fertile soil with the water…and fashion therefrom a crescent-shaped figure, which they cloth and adorn, this indicating that they regard these gods as the substance of Earth and Water.” (Isis and Osiris, 39). Yet even his accounts were still obscure for he also wrote, “I pass over the cutting of the wood” opting not to describe it since he considered it as a most sacred ritual (Ibid. 21). In the Osirian temple at Denderah, an inscription (translated by Budge, Chapter XV, Osiris and the Egyptian Resurrection) describes in detail the making of wheat paste models of each dismembered piece of Osiris to be sent out to the town where each piece was discovered by Isis. At the temple of Mendes, figures of Osiris are made from wheat and paste placed in a trough on the day of the murder, then water was added for several days, until finally the mixture was kneaded into a mold of Osiris and taken to the temple to be buried (the sacred grain for these cakes were grown only in the temple fields). Molds were made from the wood of a red tree in the forms of the sixteen dismembered parts of Osiris, the cakes of ‘divine’ bread were made from each mold, placed in a silver chest and set near the head of the god with the inward parts of Osiris as described in the Book of the Dead (XVII). On the first day of the Festival of Ploughing, where the goddess Isis appears in her shrine where she is stripped naked, paste made from the grain were placed in her bed and moistened with water, representing the fecund earth. All of these sacred rituals were climaxed by the eating of sacramental god, the eucharist by which the celebrants were transformed, in their persuasion, into replicas of their god-man (Larson 20). With the rise of the cult of Osiris during the Middle Kingdom the “democratization of religion” offered to even his most humblest followers the prospect of eternal life, with moral fitness becoming the dominant factor in determining a person’s suitability. At death a person faced judgment by a tribunal of forty-two divine judges. If they led a life in conformance with the precepts of the Goddess Ma’at, who represented truth and right living, the person was welcomed into the kingdom of Osiris. If found guilty the person was thrown to a “devourer” and didn’t share in eternal life. Purification for those who are considered justified may be found in the descriptions of “Flame Island”, where they experience the triumph over evil and rebirth. For the dammed complete destruction into a state of non being awaits but there is no suggestion of eternal torture. Divine pardon at judgement was always a central concern for the Ancient Egyptians. During the reign of Seti I Osiris was also invoked in royal decrees to pursue the living when wrongdoing was observed but kept secret and not reported. Eventually, in Egypt, the Hellenic pharaohs decided to produce a deity that would be acceptable to both the local Egyptian population, and the influx of Hellenic visitors, to bring the two groups together, rather than allow a source of rebellion to grow. Thus Osiris was identified explicitly with Apis, really an aspect of Ptah, who had already been identified as Osiris by this point, and a syncretism of the two was created, known as Serapis, and depicted as a standard Greek god. The cult of Osiris continued up until the 6th century AD on the island of Philae in Upper Nile. The Theodosian decree (in about 380 AD) to destroy all pagan temples was not enforced there. The worship of Isis and Osiris was allowed to continue at Philae until the time of Justinian. This toleration was due to an old treaty made between the Blemyes-Nobadae and Diocletian. Every year they visited Elaphantine and at certain intervals took the image of Isis up river to the land of the Blemyes for oracular purposes before returning it. Justinian would not tolerate this and sent Narses to destroy the sanctuaries, with the priests being arrested and the divine images taken to Constantinople.